The good news is... companies like ours (AHH! Products) have been in the bean bag chair business for a long time, and have always done our best to offer the best bean bags we can. From the inception of our company in 1998, we have used only top quality materials and workmanship on our products to ensure durability and safety. We're still around almost 15 years later with no product recalls or other safety issues. What do we do to ensure safety? Well...our child-resistant zippers keep kids out of the filling. Our double-stitched seams make sure nothing breaks or leaks. Our high quality fabrics are non-toxic and some are even organic. Heck, even our YKK zippers were chosen for their strength and quality. Plus, our seamstresses work hard to ensure you get a great product that will last and is safe. The bad news is... other bean bag manufacturers have had some serious issues in the past when it comes to safety. The biggest danger has been with zippers that are not child-resistant. Here's a summary of some of those issues, with the companies involved notated when possible. At the end of this article, I've noted my thoughts on what lessons this teaches us (and what you should remember when buying and using bean bags). March 16, 1995, WASHINGTON, D.C.
As part of its ongoing investigation of deaths and injuries associated with bean bag chairs with zippers that were NOT child-resistant and could easily be opened by children, the U.S. Consumer Product Safety Commission (CPSC) announced a repair program for at least 10 million zippered bean bag chairs. Children were unzipping the bean bags, crawling inside, and suffocating from inhaling the filling. 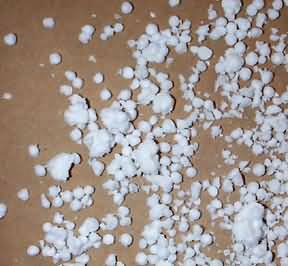 Some children choked while playing with filling that had leaked from broken bean bags. The filling clogged their mouths and noses. These chairs have been sold across the country in stores such as J.C. Penney, Kmart, Montgomery Ward, Sears, Toys 'R' Us, and Walmart. July 7, 1995, WASHINGTON, D.C.
CPSC and (5) additional bean bag chairs manufacturers announced the voluntary recall of about 142,000 more zippered products. The recorded deaths and injuries did not involve these companies, but these products are deemed in need of repair. April 2, 1996, WASHINGTON, D.C.
CPSC and Meri-Jon Artist Colony of Lexington, N.C., announced a major cooperative repair program for 150,000 zippered bean bags. None of the deaths and injuries the CPSC knows of involved Meri-Jon Artist Colony. Meri-Jon Artist Colony has sold bean bag chairs nationwide since 1980. Only the freely-opening zippers are a problem and should be repaired or thrown away. ACCC, The Australian Competition and Consumer Commission, acted to withdraw two brands. Further information is available at the http://www.accc.gov.au. CPSC launched its 5th national "Recall Round-Up" to get unsafe products out of homes. "While you are Spring cleaning, check your attic, basement, garage, and storage areas for products that could be dangerous (like recalled bean bag chairs)," said Vermont Health Commissioner. "The CPSC can get dangerous products off store shelves, but the challenge is to get them out of homes." Baseline Design Bean Bag Chairs Recall for the zipper issue. Powell Company Recalls Anywhere Lounger Bean Bag Chairs Due to Suffocation and Strangulation Hazards. You can contact Powell Company at (800) 622-4456 from 8 a.m. to 5 p.m. PT or online at powellcompany.com and click on Anywhere Lounger Safety Enhancement Kit for more information. Units Involved in the recall: About 6,300. The "Anywhere Loungers" are 100% polyester or 100% cotton and measure 51 inches in high X 43 inches wide. Recalled colors include purple (item 199-B004), chocolate (item 199-B005), bayou blue (item 199-B006), pink (item 199-B007), lime green (item 199-B008), denim (item 199-B009), black and white (item 199-B012), striped black and white (item 199-B014), natural (item 199-B016) and camouflage (item 199-B017). The item number is printed on the product packaging and Powell Company is printed on the label on the bean bag chairs. Immediately take the Anywhere Lounger away from young children, inspect the bean bag chair to see if the exterior zipper can be opened. If it can, contact Powell Company to receive a free Safety Enhancement Repair Kit. Sold at furniture stores nationwide including W.S. Badcock, Value City Furniture, Nebraska Furniture Mart and online at Groupon.com from June 2012 to February 2013. 1. Check that the zipper on your bean bag cannot be opened. The zipper should either be disabled or child-resistant. 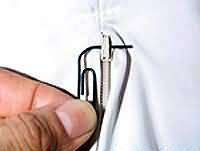 Child-resistant zippers will not open without a special tool and the knowledge of how to use the tool to unzip. 2. Take any bean bag chair with zippers that open easily and freely away from children IMMEDIATELY. We suggest returning the bean bag if possible citing safety reasons. Even if you cannot return it, throw it away to be safe. 3. If you want to keep a bean bag with a zipper that opens freely, take it away from children and call the manufacturer for instructions on how to prevent the zipper from being opened easily. Make sure the zipper will not budge without a special tool before allowing kids to use it again. 4. Don't sell or buy any recalled bean bag chairs. Pay attention at yard sales! Note: bean bag chairs made with a small, T-shaped plastic tab attached to the zipperhead are part of the recall and must be repaired. For a descripton with photos of our child-resistant zippers and safety information, go here. It will give you an idea of how a "locked" zipper should operate.